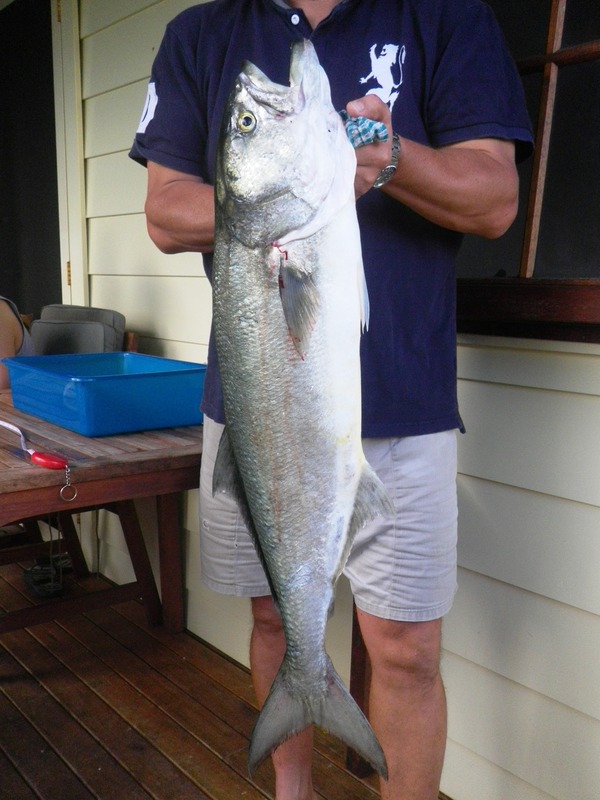 Hello – I am the Landangler – a mad keen land based fisherman living in Brisbane, Queensland, Australia. I only fish from the shore and I mainly travel up and down the east coast of Australia looking for the best land based angling opportunities. I love to fish with lures (soft plastics – hard bodies – slugs) but I will certainly use bait if that is what is needed to catch fish. I concentrate on the beaches, bays, rocks and estuaries of South East Queensland and Northern New South Wales. This is my blog/ fishing diary where I post fishing reports and stories about the ones that got away. I hope you like it. Excellent Blog, Really informative and I love the information on the plastics for all us novice plastic angler’s. Great effort with the blog mate, i especially love all the good photos you take. Hi Landangler, im going to be over you way in a few months, we should hook up for a fish!! 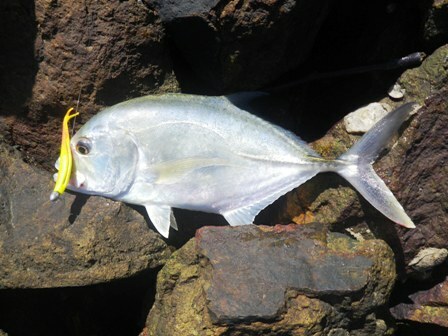 I’m planning a winter rock fishing trip to mid north QLD would 1770 be my best bet for this time of year (early Sept) ? If you are land based then 1770 has a lot of options, beach, rock, estuary. The weather is also pretty good right now – not too hot / cold. The Deep Water National Park , just to the south is fantastic, but you really need a 4 wheel drive to get to it. The Catwalk at the main headland, at 1770 can be a a bit hit and miss. The Tuna are not usually around until mid October, but at this time there are usually plenty of Tailor and Trevally. But from the Catwalk, south, there are rocks at the corner of every beach and bay and all are good to fish. 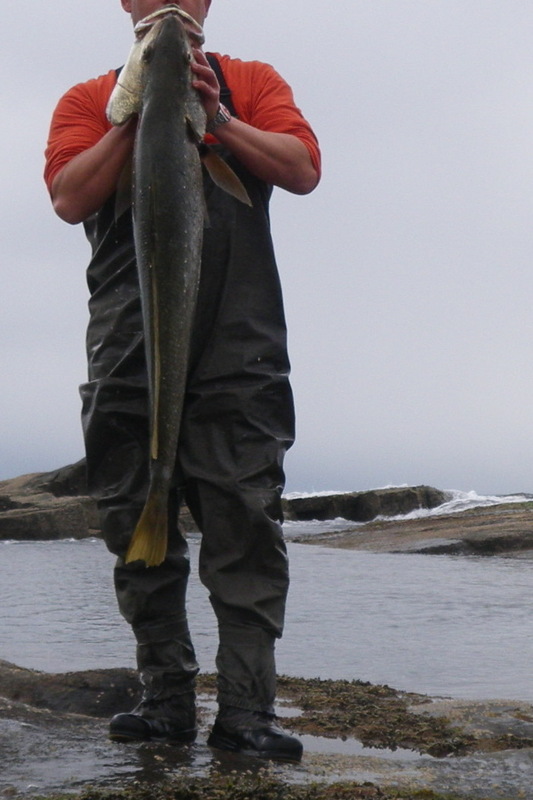 I have been following your epic fishing reports and you have a good way of presenting your knowledge in detail. I wish I had the energy and dollars to do what you obviously love to do, fuel costs for me is the critical component of any good fishing adventure. A mixture of Malcolm Douglas and Les Hiddens combined….I love it. Mugsey – there were plenty of Flathead around this morning, I dropped a couple of good ones just near Buckley’s Hole. I would recommend the GULP 4″ Pearl Watermelon Minnow rigged on a 1/6th 1/0 jighead – drag it across the sand banks and along the edge of the weed beds and you should find a few fish – good luck. Gday Landangler……first of all…..thankyou! I stumbled across your blog whilst fishin (pun intended lol) for the good oil on Sunshine Coast fishing. 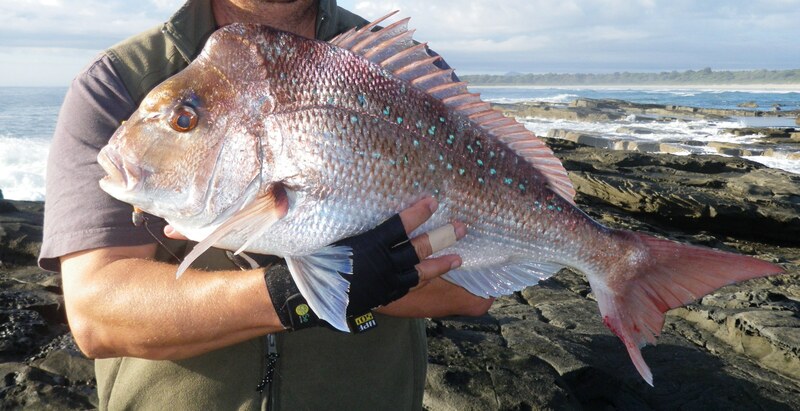 I have been an occaisional, inexperieced land based fisherman on the Sunny Coast, mainly when on holiday there…..with a few “lucky” catches (I seemed to do alright with Snapper on occasion). I have what will be to you, a silly question (sorry)….but as you are so mobile when fishin, what do you use to carry all your gear on you, I cant see you walkin back to the beach constantly to a tackle box, when your are wading, to change your rigs? Thanks for your comments. I have a vest with lots of pockets and clips that I keep my lures, jigheads, scissors. cloths, camera, etc in. I also have a fish keeper bag that I hang over my shoulder. I will send you an email when I next have an appropriate fishing session planned up that way and perhaps we can meet up. Thanks for your reply Landangler. A vest, of course, will have to look into one of those. Good to read a blog showing fish I cannot hope to catch but using methods that are common to us over here. Like you I only fish from the shore and have concentrated mainly on baits for the last few years. I hope to get back into lures this coming summer. On my local beaches I can target Bass, pollack coalfish, wrasse garfish and mackerel on softies. The mackerel are small a 2 pounder would be a good fish but they fight well on light tackle, make a good bait and taste good. Bass would be our main sporting fish. our record is around 17lb but an 8lb would be a good fish on the lure. Hi I fish bribe all the time with the kids but we always get there to late in the day. I’m on holidays so I will try and get there early for a fish without them tagging along.I love your detail and specific locations, email if u like to fish with a newbie!! Well done and congratulation for what you have done here, great blog! I moved to Australia 6 months ago and discovered fishing then, I’m addicted now and can’t get enough of it! I discovered this blog last night while looking up for tips to fish on Bribie Island and ended up spending most of the night reading it! I’m a newbie looking up for detailed tips and location and I think I just found the perfect place! I usually fish on Bribie Island (bongaree) but thanks to you will have a go at Sandstone Point ! Never fish with Plastics before but always wanted to give it a go so thanks for giving me the confidence! PS: Next time you are fishing on Bribie and see a young french guy struggling with plastics, wearing a green hat, come and say hi ! I should be there quiet regularly from now on! Hey great blog, great fish and very informative. any chance you could write a guide on using soft plastics? always been a bait man. live in tweed and go off the rock wall without alot of luck lol. I will do – when I get a moment. A few people have asked for the same. The Tweed rockwall is a great spot but it can be hit and miss. Keep at it. awesome thanks, went out in the rain today and got a nice tailor with a 50 gram slug off the wall, not huge about 45cm. Just wanted to say you have inspired me to get out there and fishing again. I had my first session near buckleys hole in the rain and caught no fish. But didnt care I got a few bites and was the first time I have ever used plastics. Can’t wait to catch my first fish on them. Keep up the great work a bloody awesome read. Both good spots but Bribie probably has more options. There a plenty of Flathead, Pike and Bream around at the moment. mate…thanks for the interesting blog. you have got to see this you tube post… http://www.youtube.com/watch?v=KBKAulfHxC8&feature=related – it has whiting doing things that I simply don’t understand…the aggressiveness of the fish for the lure is astounding…though the tube post is a little poor in quality, you can still see these animals fighting like tailor to get on board. I google mapped the Tuross channel. from what I can make out from the barrier system behind him, he’s right near the mouth of the Tuross system. Have you even journeyed that far south? do you reckon your Duo lures could give the whiting a nudge? I notice also that you use a 2500 Stella. I have one too but, I think this bloke is using something in the order of a 1000 size real. I think I may have stuffed up and bought too big a Stella for whiting. Incidentally, why is it that Wikipedia shows whiting distribution right up the eastern seaboard and yet, I can’t find you catching them? not in your target list perhaps? My ole man was a pilot in the Qld & Torres Straight Pilot service and said to me that of all the fish he knew, whiting was third, Jewies second and Sweetlip Emperor first on the good taste graph. your thoughts… regards Sydney sider ! I love Whiting and there are plenty in the areas I fish. My problem is that you need to target them with very light gear – which means when something bigger comes along, you have no chance. I think I am also not quite patient enough to seek them out. Something tells me I will be better at chasing them when I have a bit more grey hair! Great clip! You are a legend. I love reading your blogs my mate and i are always checking our emails for your latest post. Your posts always make me keen to go fishing. I already have learnt so much stuff from you. Thank you! Quick question what is your all time go to soft plastic and what jig head size? Aslo could you please make a video or a post about soft plastics? I had been looking around the net for info on some great fishing spots at bribie island and then I found your blog. I think it’s fantastic with a good combination of fishing advice and some awesome fishing stories and it has really made me keen to start fishing more often. I have tried a couple of the places you’ve mentioned on your blog (namely bongaree and the old oyster jetty) but with no luck. What are your preferred tide times to head to these places and also how much does the time of day make a difference? Also it would be great if I could tag along with you next time your up at bribie island. I live only 30mins away so getting up early is not a problem. Fishing at dawn and dusk will greatly improve your chances of catching fish. All over Bribie I prefer to fish the few hours of the run out tide – good luck! Do you do any comps – ABT? also you should make a vid on how to fish plastics or report? The ABT looks fun. land based, but its is difficult for me to commit to the timing. It would also have a lot to learn about Bream fishing! Its taken a few years to get the hang of the digital camera. It will be a few more before I master video! Great Blog! Its very informative and for a beginner angler like my self its good reading and learning. If you don’t mind me asking where do you get your DOU lures from? Love reading your blog mate. Learn more and more each time I read. Could you possibly do a few posts on fishing tips? What to look for, what times are good etc? Hey mate I read your Blog each week.. It’s really interesting.. I’m also a land based angler in the brisbane area.. Keep up the good work! Mate awesome blog! I really like your articles and the pic’s are brilliant! We only started blogging in December 2012 so are only quite new at it…well done mate! hey land angler i am looking for a nice light rod to use off the rocks for tailor with slugs but also off the beaches and gutters for bream and flathead on hardbodies and soft plastics. i was wondering what type of rods u use??? First off may I what a good blog your writing, very helpful and informative. I just started fishing with soft plastics, got myself a pfleuger trio 2-4, and sedona 2500. I’m only land based, I tried fishing Toorbul side on the incoming tide, god it was a nightmare, i had seen a few oyster patches that looked like some great structure, i got there, and the amount of stingrays around me was insane, i think i counted 30-40 of them playing around in the shallows while i was trying to walk back to the car, nearly standing on a few of them! Anyway i’ll be heading up to your location hopefully on Sunday, What is your suggestion for time, as i see it is the low tide in the morning and hide tide isn’t till 12. Should i wait till high tide around 12 and fish the outgoing tide around the bridge, with some Zman 3inch minnows, or 2.5 grubs? Or go early at the low tide? Which do you think would be better? If you could send us an email, or a msg with any suggestions that would be great. Always looking for advice as i just started. Thanks in advance. You will nearly always improve your chairs of catching fish by starting early. Fishing at low tide also enables you to see the terrain are clearly. Mate thanks for taking time to write and help the newbies out. I am looking to fish Breakky Creek early in the morning and I was wondering if hard bodied lures are a good way to go? I have not fished it myself for a long time but they get plenty of threadfin Salmon, Jewies, Flathead and Bream out of it. Its full of trolleys and other snags though, so you may lose your hard bodies before you catch a fish – take care and good luck. I love my 6’6″ Loomis GL2 (fast action) 1-3 kg and Shimano Stella 2500. But there are plenty of good cheaper versions/ combos for soft plastics. I also love Gary Howards light spin rods and the Berkely Dropshot range are pretty consistent. I think the cheaper Pflueger 2500 size reels are also pretty good value. Hiya, I’m from Lowestoft (east coast of England) and I’m visiting Australia for the first time. I’m staying with family in Brisbane, and I am intending on sneaking away from the wife for some fishing. I’ve brought some bits and bobs but didn’t manage to bring a rod. You wouldn’t happen to have an old beach caster (I think u chaps call them surf rods) kicking around that you could sell me cheap? I couldn’t fit a rod into my luggage! A broom and six curtain rings would do..
Im a Brissi boy but live in London, i have been over for a few weeks now and only have a week left. Wondering if you could point me in the right direction to use plastics to target bream, flatties and or tailor. Im in Birsbane but willing to travel an hour or 2 to get to some locations, Bribie or Gold coast would be ideal? Best to try fishing at Bongaree with the Gulp range of soft plastics, if you look back through the archived posts you will get plenty of info on where and when to fish. One thing is that i dont have waders is this going to affect what i can do as i get the feeling you are wading out a far old way mate? Would you be able to enlighten me on what wind is going to be favourable fishing at Bongaree? Im assuming SE would be good as it should be behind me at Bongaree? Enjoy the blog a lot! 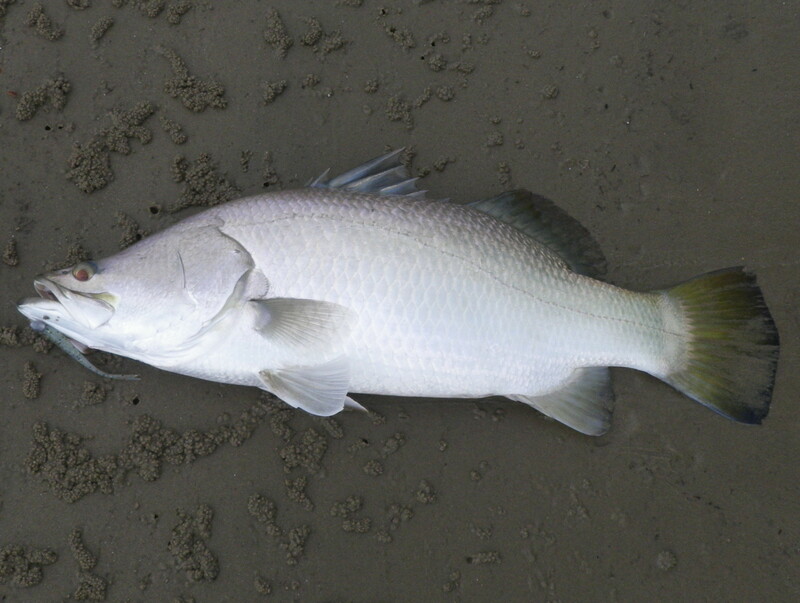 You catch some very nice fish around SE QLD. This is going back a bit, but i was wondering if you could be more specific about that rock wall at Pinkenba. I read your post on here and also on tackebox going back some years, I’ve seached Google maps and still not quite sure where this ‘sunken rock wall’ is at Boggy Creek. Is it the BP refinery you would walk around to get to the top? Or would you walk from Pinkenba boat ramp at Kirra St? Appreciate any information. Keep up the good fishing and providing us with a good read. Good setup and pictures, well done. I’m form Sydney and rock fish mostly. Going North for a few days and wonder you fished Broken Head near Byron N. NSW? Top blogs mate – love them so much am moving to Sandstone Point in 4 weeks. also what weight you use when fishing Bribie? Seriously though – great blog, cheers. Hi How do you deal with the sandflies ? Very informative….can you tell us a bit more about what gear you use outside of the jig heads and lures? Eg: Rods, reels, waders etc…. Great blog, congrats, keep it going and thanks for sharing it with us. I’m Naomi from vivima.com, which is a cross-border e-commerce website selling Japanese merchandises to customers world wide. We provide proxy buying service for fishing lovers also in Australia. You can find a large number of high quality Japanese fishing tackles in our website, such as daiwa, shimano and other well-known Japanese brands. We are wondering if we can insert some advertising banner in your website, and would like to know about the possibility and cost. i follow your blog with great interest. Do you happen to fish closer to brisbane at all? eg redcliffe penninsula or any of the local rivers? fantastic blog mate only recently started having a look at it but I’m hooked! great info and very detailed. I’m heading up to north stradbroke island in a few days (without a 4wd) and I’ve read your stradie post, but would you have any extra tips for this time of the year ?